Dot paintings vary from the finest of minute marks neatly arranged on the canvas to the wild multi-coloured large dotting of some of the desert women. Some artists merge their dots into lines, or even into wide areas of connecting dots which have more of a stippled effect than a 'dotted' appearance. The defining criterion for a dot painting is the technique used - that it is produced by repeated imprints of a paint covered brush, dotting stick or other implement onto the surface of the painting and that in doing so, there are recognisable 'dot' marks on the canvas. Within the Dot painting style, Aboriginal artists may overlap or 'enclose' dots within other larger dots, or they may be closely joined to give the appearance of lines, and even dotted so densely that they create a flat coloured area - however to be a 'dot' painting, the dotting method must still be visible. Aboriginal Dot paintings are commonly executed in both Ochre paintings and Acrylics, however Acrylic paint is the more commonly used for these artworks. The paint used may be highly textured with a very raised surface or flat. Perhaps the most proficient dot work is done by using well mixed acrylic paint with a high level of viscosity (thickness and cohesiveness) - when this dries, it forms a raised profile - from the side, this makes a curved shape on the canvas, with the centre of the dot highest and a tapering effect towards the edges. Dots range from exceedingly fine work done with very thin sticks, to large dots of up to four centimetres in diameter. 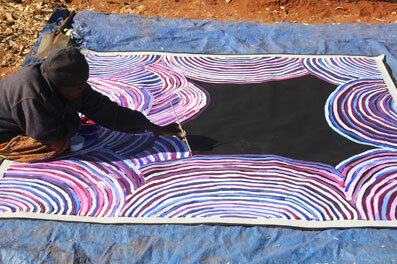 The patterns may be extremely neat, traditional designs, some using Ochre paints and some using Acrylic. Or they may be wild, overlapping, unstructured works where the Aboriginal Artist is highly expressionist in the execution of the work. 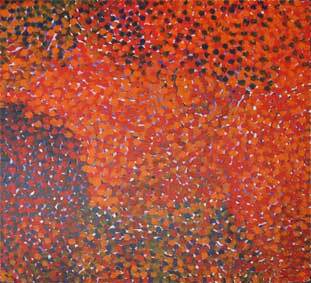 Some of the most exciting dot paintings artistically, are those painted by older Aboriginal Artists. Not only do these artworks represent ancient stories and iconography, but by virtue of the advanced age of the artists, frequently in their seventies, eighties or even older, are less precise and steady than works by the younger generations. This gives the works a beautiful, painterly quality and a loose, relaxed style which is not only aesthetically pleasing but can often be a signature of the Aboriginal Artist's work. For example, George Ward Tjungarrayi's works of recent years can be recognised instantly by the occasional 'tadpole' dots where as he lifts his stick from the canvas a short tail of trailing paint is created. Some of Walangkura Napanangka's works also, gained a wavery and less precise quality in her later painting years. 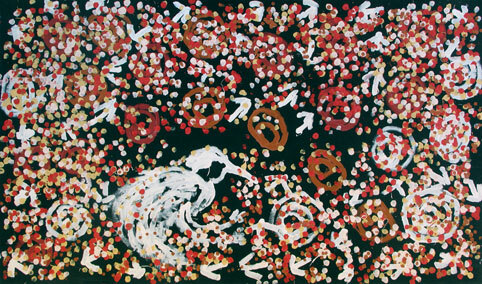 Works by other Aboriginal artists such as Ningura Napurulla and Mitjili Napurulla also went through stages of increasingly unruly dotting work, because of eyesight or other health problems, and then later and following successful treatment of their conditions, the artists began to produce works which were amazingly neat by contrast. Correlating the year the Aboriginal artist painted the work with the unique quality of their dot work is one important way (but not the only way) of being sure of its authenticity. Similarly, the way an artist places their dots and the quality of their dotwork and paint application is as recognisable as a signature to someone who knows their work, and it is relatively easy to recognise the Aboriginal Artist simply by looking at their dotwork. How did 'Dot Paintings' originate? 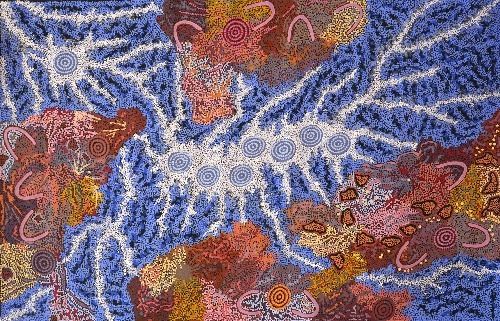 There are several theories as to where or how dot paintings originated, and it is likely that all of them have their part to play in the works of different Aboriginal artists. tantalisingly allows parts of the underpainting to peep through. One certain reason is that early in the Aboriginal art movement, the People were concerned that non initiates may be able to understand or learn the sacred, secret or restricted parts of their stories. Drawing a painting in sand had previously posed no problem because it was generally smoothed away after the telling, or if left on the ground, it was done so only in their own lands, safe from prying eyes. But the permanent quality of acrylic paints gave birth to a concern about inappropriately revealing secret information and the subsequent practice of 'overdotting' served to obscure the sacred or 'classified' information beneath. The examples above and below, by Galya Pwerle and Johnny Warangkula are excellent examples of the technique of using overdotting to obscure the painting beneath. It is now fairly much understood that the uninitiated westerner cannot understand the iconography anyway (in other than the most basic way - see our page on iconography), and so the practice of overdotting to hide what is underneath, has largely fallen away. It's a pity in some ways, because the extra dimension in works like Galya and Johnny's is fascinating. of overdotting being used to obscure secret information beneath. A second source of the dotting style is that the educational sand drawings carried out mainly by the Central Desert peoples, were intrinsically made up of both line and gestural dot work. The dotting style of many of the Aboriginal artists from this region was a natural evolution from their sand drawings as they translated the stories on the modern materials of paint and canvas. A third, which is not altogether separate from the second, is that the land itself, the subject at the heart of many Aboriginal artworks, is often completely studded with dot like stones, spinifex plants, flowers and distant trees. The 'dotted landscape' inspired its representation in dot patterns. Like any art style, especially those that are successful, dot painting inspired other Aboriginal artists to develop dotting styles of their own. Subsequent generations learning from their families, took the style even further. Now Aboriginal art is best known by dot artworks (although when you get to know more, you realise dot paintings are NOT all it is about). Nonetheless, they are very sought after and there are some excellent dot painters in the genre. To see a whole range of examples, go to our Aboriginal Art Search page and just select dot paintings from the drop down menu in the Art Style section. You can select any kind of dot painting from fine dots, through to medium and loose and wild. To see the dotting technique close up, click the thumbnails and then click again for a zoom view.